Senior GOP statesman George Shultz urged Republicans on Friday to be proactive on climate change, calling it an "obvious risk" to the economy and national security. The former secretary of State for President Reagan says that rising temperatures could be addressed through an inexpensive "insurance policy," similar to Reagan's support for restrictions on gases that degraded the ozone layer in the 1970s and '80s. In this case, Shultz supports a revenue-neutral carbon tax that would begin small and slowly increase. He often points to melting sea ice in the Arctic as a sign of changes to the climate. "I think the people who say the climate isn't changing are going to be mummed by reality," Shultz said in a webinar hosted by the Massachusetts Institute of Technology's Climate CoLab. "It's changing, and there's all sorts of evidence out there," he added. "And it isn't just the science and it isn't one-off events like a hot summer or something. With the Arctic Ocean being created, that's a trend line. These huge melts all over the place, that's a trend. Greenland is becoming green. So the climate is changing, and the most plausible explanation is the CO2 explanation. So I come back to President Ronald Reagan's approach. Why don't we take out an insurance policy?" Shultz, 93, first proposed a carbon tax last year, joining a handful of other conservative economists, analysts and former lawmakers who believe that pricing the gas can benefit their political party, address environmental concerns and end energy subsidies. A condition of their support includes enacting tax cuts on income and businesses. Can a Republican president push a carbon tax? Lawmakers are not keen on the idea, however. The Republican-led House of Representatives, the Democratic-controlled Senate and even President Obama have all voiced opposition to the idea in one form or another as they head toward critical midterm elections this fall that promise to shape the direction of Obama's final two years in office. 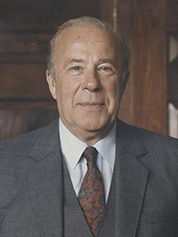 Former Secretary of State George Shultz. Photo courtesy of Wikipedia. Bob Inglis, a former Republican congressman from South Carolina who now heads the Energy and Enterprise Initiative, believes there could be more room for the GOP to consider the tax plan after the November elections. Better yet, he predicted that climate action could accelerate if a Republican president is elected in 2016. "The Great Recession is letting up. Barack Obama is going to be a lame duck after ... November. So Obama rejectionism is going to decline," Inglis said on the webinar. "We've got an opportunity at that point to push forward on a very different proposal, different than cap and trade, and give conservatives the opportunity to actually lead on this." He added later: "I know this is sort of a strange thing to say, but I wonder if we'd be further along on climate action if Mitt Romney had won" the presidency in 2012. "Perhaps it's only a Republican who could touch climate change. Because then people will think, 'OK, he or she's not overreacting. They're not going with apocalyptic visions.'" Both former officials sharply criticized Obama for pursuing executive action on climate through U.S. EPA. They also ridiculed Democrats' efforts in 2009 and 2010 to pass cap-and-trade legislation. Shultz said Obama's executive actions conflict with old-school bargaining strategies practiced by Reagan and Tip O'Neill, the Democratic House speaker from Massachusetts. He recalled that Reagan would often invite lawmakers and their families to the White House theater for informal events and a chance to build relationships. Room for bipartisan maneuver in this Congress? "I don't like it when a president starts out by saying, 'Here's my program and you stupid people in Congress don't have the sense to do anything about it,'" Shultz said, referring to Obama's EPA regulations. "You can't ignore Congress and cuss Congress out all the time." But Phil Sharp, a former Democratic congressman from Indiana and the current president of Resources for the Future, says Shultz's description neglects Obama's efforts to put a price on carbon and his proposal to enact a clean energy standard -- both of which were rejected by Republicans. "But let's not forget there's a major faction in the House that really tries to sell the snake oil," Sharp said on the webinar. "When [Obama] turns to them and says, 'We have a problem,' they say, 'No, we don't. We don't have a problem.' They are science deniers. I think that's shrinking. I think that's changing." Looking back, though, Inglis sees a missed opportunity. Instead of telling Congress in his State of the Union address last winter that climate change is "a fact," Obama could have pitched a carbon tax, turning the speech into a live television negotiation with House Speaker John Boehner (R-Ohio). "Now that would have been breaking things loose," Inglis said.